It is a metal bodied adapter by any chance? Do you have a pic just to see what is going on. Yes it will be. The higher the cap value, the more bass will enter the circuit so try something a bit lower to brighten things up. Hot Damn! I may have some inking of what I'm doing some day. Luckily I keep my failures around to pilfer parts from. The 22 made all the difference. It really sounds nice. I couldn't open it up 'cos the family was sleeping. Thanks for your help as always. Any mods to this simple circuit? There isn't too much there to mod to be honest. You could use a DAM Red Rooster style Range pot to pan between two input caps to act as a pre-gain tone control. 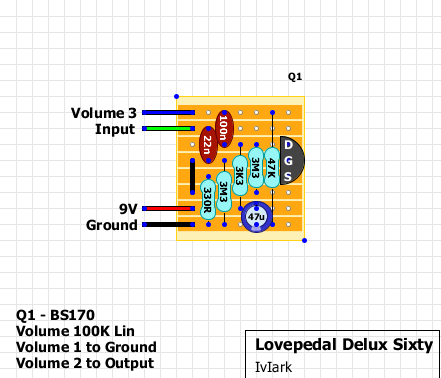 Or you could add a variable gain control, remove the 330R source resistor and put in something like a 1K pot (source to lug 3, lugs 1 and 2 to ground - or you could try lug 2 to 10uF cap to ground). I don't know how useful either of those would be with this circuit but it could be worth a try, especially if you can breadboard first so you can choose the cap and pot values to suit your own tastes. Does more resistance on the source resistor to ground increase or decrease the gain? i don't know if anyone cares, but this one fits real nice into a 1590a enclosure. real easy to build, and sounds good as well. i found it to be pretty a clean boost, but it gets a little dirty when its turned up. 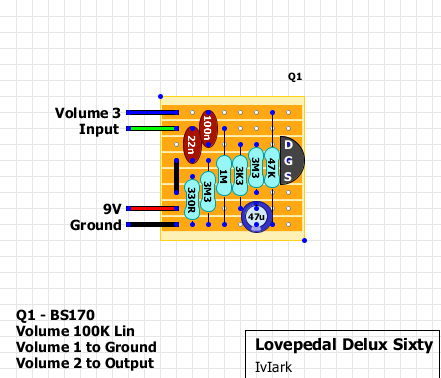 this was actually the first circuit i built using your layouts, and now i've got the bug again! It's a very clean boost, which is pretty cool - makes sense that way given the only control is volume rather than something which interacts with the circuit. Sounds amazing infront of an Amp 11, built them in the same box. One problem - it pops very loudly when bypassed - I'm using mosfet (BS170) millenium bypass - is there any resistor that I could put it to stop this? Yes you could try putting a 1M resistor between the input wire and ground. There's not a lot of room there on the board to fit it in but you could sit it over the top of the 3K3 (may be worth insulating the leads with wire cut offs to be on the safe side) or alternatively solder it directly onto your stomp switch, between the board input wire lug and the ground lug for the LED. I managed to tag one in on the back, and solved the popping as you said. Just thought I should update - nice one. Excellent, glad you sorted it and thanks for letting me know. I've added one to the layout, it's a worthwhile addition. Such a fantastic clean boost. I've been building quite a few without commenting. I figured I should start doing so! thanks so much for the layout! 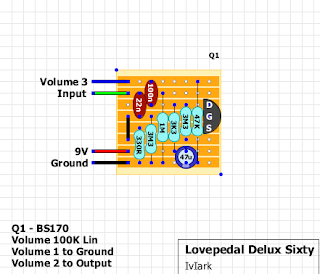 this thing sounds great, do you have an off-board wiring guide for putting two pedals together in one enclosure? I'd like to put this deluxe 60 in with another OD or distortion. Just use the offboard wiring guide here but instead of the first switch going to the output socket, you connect that to the input lug of the second switch. Input socket > switch 1 input lug > board 1 > switch 1 output lug > switch 2 input lug > board 2 > switch 2 output lug > Output socket. I have a no sound when I push on. But off mode the pot in/decresase de volume when I turn it. What about ? Something is seriously wrong with your offboard wiring if the volume control is working during bypass. How have you got it hooked up? Just built this and it worked first time. Very nice and effective. I think I've got the bug to do more. Great work lVlark! Does this work if i replace the 3M3s with 1Ms? i dont seem to be getting any sound at all. That's part of the bias network but I would expect it to work with 1M's as well. If you're not getting a sound then I suspect the issue is something else. oh my! How can i mess up with so few parts! Haha. I'll go check for any misplaced components/solder bridges. Just to confirm, there are no track cuts? The Transistor was fried, swapped it out for a new one, and it works! Built this into my First Act Garagemaster. The old preamp died horribly. Adds some nice bright presence and a bit of gain. Sounds good but not overwhelming. Tiny and worth a try! If you use "grounded input wiring" method on the 3pdt switch the 1M resisistor isn't really necessary... I'm finding it doesn't nearly have the same amount of boost as most other boosters (i.e. SHO, LPB-1) tone-wise its nice, the lower volume I guess helps keep the tone clean and non-distorting. I don't hear much difference between this at max setting and an SHO at about half the volume output, just maybe slightly less treble than the SHO... may have something to do with the amp and guitar i've compared these two with. Haven't experimented with lowering the 330ohm resistor to ground get more output of it, not really needing to do that since I kinda like it the way it is. Does a larger value source resistor (the 330R) mean more gain or less gain? If I swap it out for say 100R, will I get increased gain? Hey, noob troubleshooter here. Am trying to fix my primitive SHO build issues and it occurs to me that this is pretty much exACTly the same circuit, with the 330R taking the place of the 5K 'Crackle OK' bit and the 47K determining the overall output... seems like you could swap it for the 100k linear pot as a master and get more output out of this. One question I have from the original mosfet boost on AMZ and other versions is the presence or lack of diodes, both from the top of the Vin to input (D to G) and/or input to ground (G to S). Obviously many of these designs don't use them, so what purpose would they serve? Also, as I am reading up on MOSFET and JFET transistors, I keep seeing that they can be sensitive to static and get zapped pretty easily. Can I sub a generic BJT (2N5088 or wotev'r lying 'round) in for the socketed BS170 just to make sure that it's NOT a dead transistor? Might ought to make different or odd but maybe useful sounds of its own. I didn't want to just throw trannys in there willy nilly but it occurs to me that it might just work. I also need to go back to it and flow some more solder but as I say I was just trying to find a problem that I might have made that wasn't just bad solder technique on my part. Plus, I'm having a hard time believing that the BS170s I got aren't mutants with a different pinout or something so was looking for a good way to test them out. Thanks for this site, it is my goto when I want to clone over-priced boosters and ODs. Cheers! Hey Buzz, I think you can put a 5088 in yeah, it'll sound awful but it'll still work (I think). No harm in trying right?